Ever since my friend Butterfly passed away, my life has become weirder and wilder, like a dive into Alice’s Wonderland. -She sent many butterflies and Master 33’s to me. -When a friend questioned my stories, he was shown two profound signs on facebook – a photo of ’11 11 Grieve’ as well as a peacock, his late mother’s favourite pet. Read more on 11:11 Clocks. -After I posted the ’11 11 Grieve’ image I was contacted by someone on facebook, who believed this was a sign from their loved one. Whoa. So, imagine my surprise when I logged onto facebook and realised that today would have been Butterfly’s 45th birthday. No wonder I saw 11.33am on the clock today (I am a Master 11 lifepath and Butterfly was a Master 33 lifepath). I also know other healers who are seeing 11.33 this week. How I miss you Butterfly! Find your lifepath. My thoughts on Wallaby as an Animal Totem – What’s the Spiritual Meaning? Note: We saw a Red-necked Wallaby, also known as a Bennett’s Wallaby (see photo). Animal messengers represent hidden aspects of ourselves – when you analyse them you can learn a lot aboutyour life purpose. The best way to figure out what wallaby means to you, is to read this article and notice any tingles, goosebumps or ‘aha’ moments. This list is just a starting point – there could be other reasons too. -A time for peace and forgiveness. According Wikipedia’s entry on the Red-necked Wallaby, these animals are masters of reconciliation. As someone with a Karmic 13 Debt (over-criticism), I’ve learned to be more diplomatic since I’ve had a baby. Words can’t be taken back once said – negative ones can leave ragged holes in someone’s aura, whereas positive ones surround them in a cocoon of light. -Someone with a shy, nocturnal nature. Red-necked wallabies rest during the day. For months, I have been napping with baby when he’s awake, and blogging at night. It’s much easier to type when you’re not holding a seven month old covered in banana. I feel guilty for staying up, but it’s been a habit for decades. Must be a writerly thing. -Someone who is solitary, but loves to socialise over food. 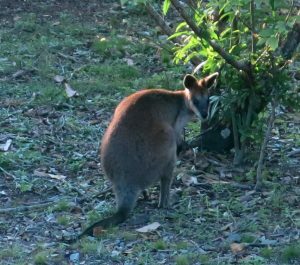 How amusing that I saw the wallaby while eating with my family – usually I am alone. Dining with loved ones has been a key factor in my recovering from anorexia/ Orthorexia over the past few years. -The need to delegate tasks and share your workload.Wallabies exhibit alloparental care, in which individuals other than the parents may raise young. This resonates as Forrest has been staying with my in-laws and friends when I do psychic readings. Yup, it takes a community to raise a Forrest. I’ve also been looking at ways to hire people to mind my business (aka baby sit my ‘brain’ child). -Someone who is a good swimmer. Wallabies find it easy to doggy paddle in water. I’ve been looking at swimming lessons within the past 24 hours, so perhaps the wallaby was a big ‘YES’ from the Universe for my idea. -Someone who is highly creative and fertile. Red-necked wallabies can fall pregnant soon after giving birth. How intriguing, as I just got my period back even though I am breastfeeding – see this post about 111 numerology. Not to mention, three psychic friends recently said I need to prepare for another child…eek! Better review my holistic fertility practices. -Women who need space from their female relatives. Female Red-necked wallabies spread out over their home range. I often joke that I moved to Queensland because I needed my own State. As much as I love my family, it’s nice to have some distance. 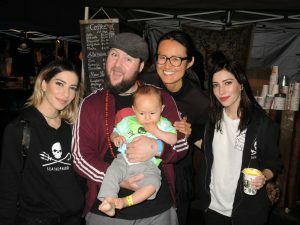 -A craving for vegetarian food and herbs – I have been spending time with vegans recently (here is a photo of us with The Veronicas at a Sea Shepherd fundraiser last weekend). Plus, as I was driving home today, I heard an ad on the radio about, you guessed it, the benefit of fresh herbs. This comes after my naturopath suggested I take herbs for digestion! So – seeing a Wallaby can mean many things. It could also be a random event (I say this tongue-in-cheek as those who know me, know I believe ‘there are no coincidences’). -A reminder that small people (including children) can be powerful. -An invitation to eat slowly and ‘graze your food’ instead of swallowing it half-chewed and blocking your throat chakra. -A nudge to make a leap of faith and move forwards (I am in a 1 Personal Year, 1 Personal Month of beginnings, so this makes sense). Find your personal year. -A suggestion to ‘stay in the pouch’ or undercover until you feel strong enough to compete with other people in your industry. -A reminder that it’s ok to start small and grow gradually over time. In numerology WALLABY – 5+1+3+3+1+2+7 = Master 22/4 energy, which is all about step by step success and long-term relationships. RED-NECKED WALLABY = 64/10/1 in numerology, so these animals have strong 1 energy – they’re individualistic (as I mentioned above) and pursue their goals, instead of waiting passively for luck. I hope you’ve enjoyed this reflection on Wallabies. As an environmental scientist turned numerologist, I love introducing people to the wonders of nature, including their magical human nature. As I publish this article the time is 11.33pm. Perfect! Fear of Spiders – What’s the Spiritual Meaning?